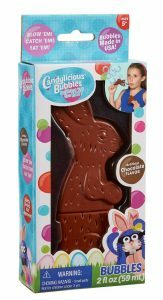 Little Kids Inc. announces a line of sweet themed bubble products inspired by the Easter season. The perfect Easter basket stuffers, new PEEPS®, Jelly Belly® and Candylicious® Candy Shoppe Bubbles products are the ideal candy-alternative that moms love – and delicious flavors that kids will eat up. Leading the line are the ultimate basket stuffers – the iconic Easter bunny – that now comes with edible chocolate-flavored bubbles! – and PEEPS-shaped bubble wands. These sweet-themed bubbles join Little Kids’ line of fun bubble blowers and wands featuring popular licenses including Entertainment One’s sizzling hot PJ Masks ™ property, Nickelodeon’s™ Paw Patrol™, Shimmer and Shine™, and Blaze and the Monster Machines. Little Kids® Inc. was founded in 1989 by toy industry leader and former Toy Industry Association Board Member, Jim Engle. Little Kids develops, manufactures and markets innovative and award-winning bubble, sports, novelty and activity toys that promote thoughtful and creative play. Consumers recognize Little Kids toys for their high quality, value and durability. Little Kids brands include Fubbles®, and No-Spill® Bubbles, a category the company created with its patented No-Spill® Bubble Tumbler® toy. Other Little Kids brands include Wicked Big Sports, Candylicious® Bubbles, and Junk Ball® Sports. Little Kids’ licensed toy portfolio includes Nickelodeon™ with brands such as PAW Patrol™, Shimmer and Shine™, Teenage Mutant Ninja Turtles™, Blaze and the Monster Machines™ and Bubble Guppies™ bubble and water toys, as well as PJ MASKS, Sesame Street®, Jelly Belly® bubble toys and PEEPS®, bubble and novelty toys. Little Kids is privately owned enterprise headquartered in Seekonk, MA.